Derek Deinonychus is a carnivore from the Custacious Period. He has a HUGE sharp claw on each of his back feet that he uses to jab and catch his prey. Push his belly to activate over 40 Dino sounds and phrases. Push the button on his back for clawing action, or open his jaw to hear roaring and chomping sounds. 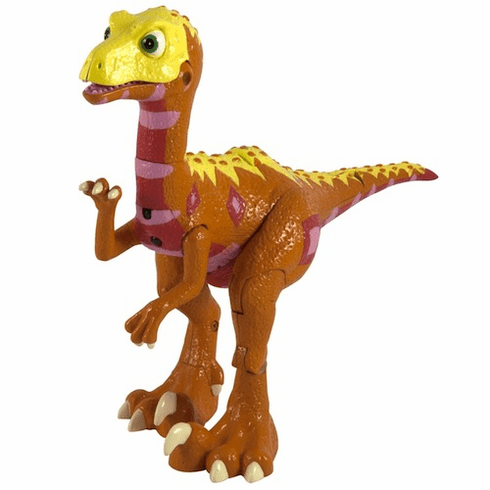 SmartTalk technology gives Derek the ability to recognize and interact with other dinosaurs in the Dinosaur Train line. Based on the Jim Henson PBS show - The Dinosaur Train. Requires 2 AA batteries.